Califone’s most rugged headset the 3066 is designed for language learning in todayÆs classrooms. 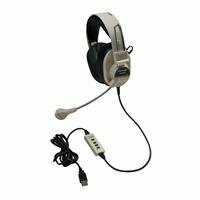 This compact adjustable headset is ideal for high speed internet listening language learning and tutorials in computer labs and other multimedia applications as well as a web phone. USB plug eliminates need for a sound card. Windows and Mac compatible. Durable ABS plastic earcups. In-line volume control. Adjustable padded headband with replaceable foam-filled ear cushions. Around-ear ambient noise-reducing earcups deliver maximum protection against exterior soundsMade with the Best Quality Material with your child in mind.